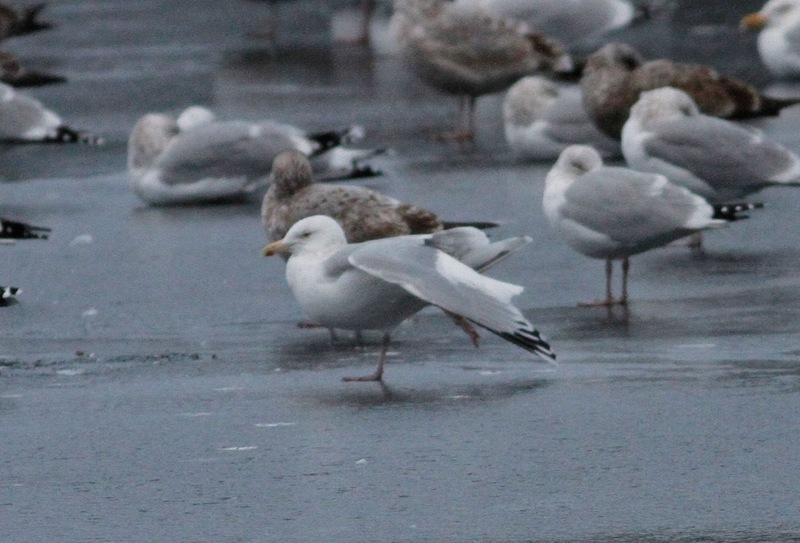 A smart adult Kumlien's Iceland Gull has graced the gull flock at Barton Cove for the last two evenings, especially noteworthy in a winter that's been especially poor for this species locally. 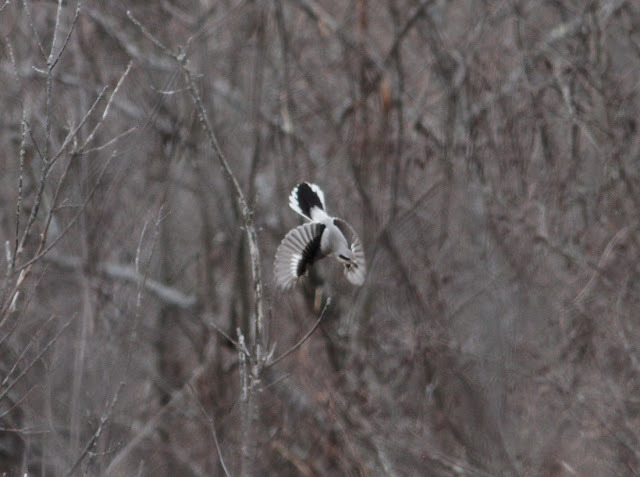 We usually have multiple individuals to watch in late February so this adult was definitely cause for a small celebration. 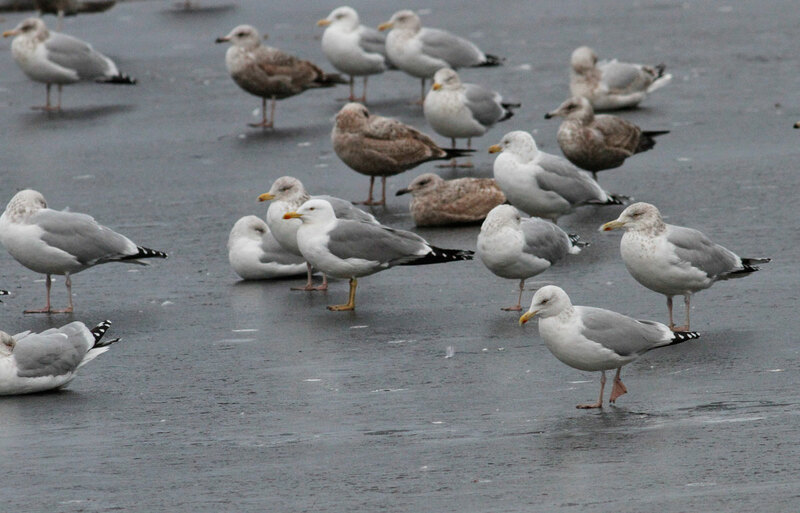 Both adult Nelson's and Lesser Black-backed Gulls continue to be seen in the same gull flock. 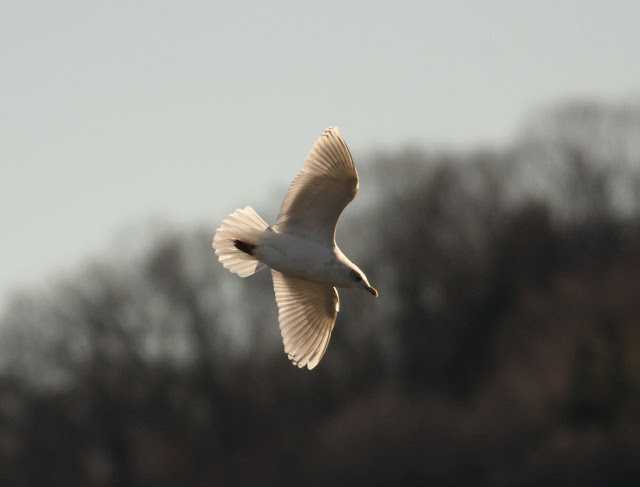 Kumlien's Iceland Gull - adult, Barton Cove, Gill, Franklin Co., MA. February 26th, 2016. Northern Shrike - Moran WMA, Windsor, Berkshire Co., MA. February 21, 2016. Nice views as pulled up in the parking lot. Put on quite a quite a show today. "your bird shows extremely limited black on p6 (restricted to outer web only), which I would consider outside of the variation in smithsonianus. 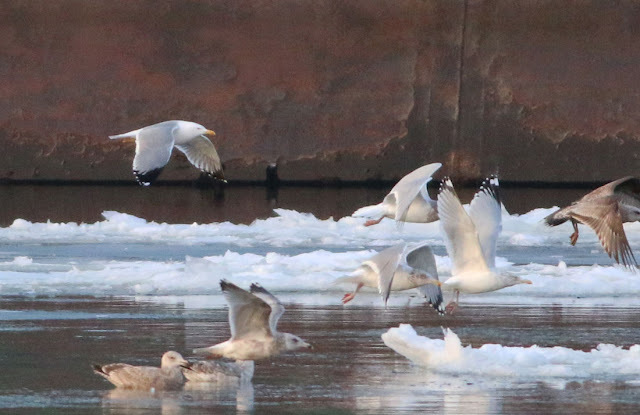 I've certainly never seen this in colonies of argenteus (which generally shows a bit less black on primaries than American Herring). 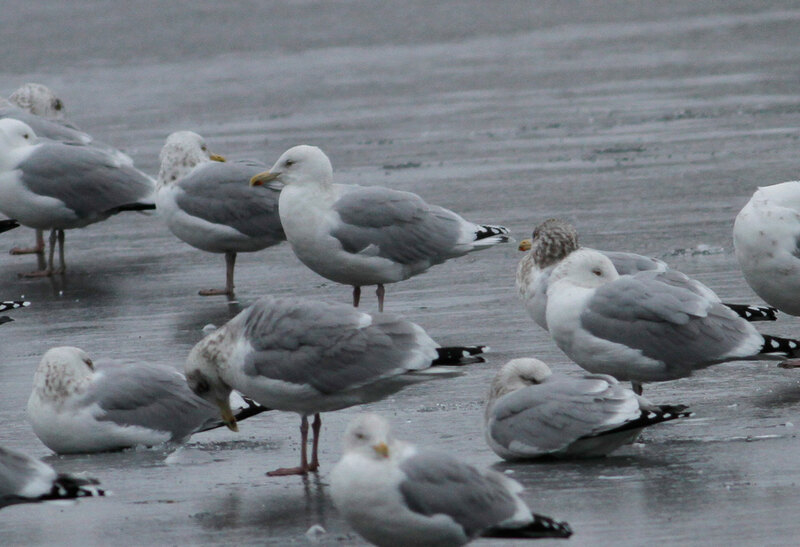 Could well be a hybrid or backcross (with Glaucous Gull). Some additional shots taken on February 22nd, 2016 at Unity Park, Turner's Falls, Franklin Co., MA. 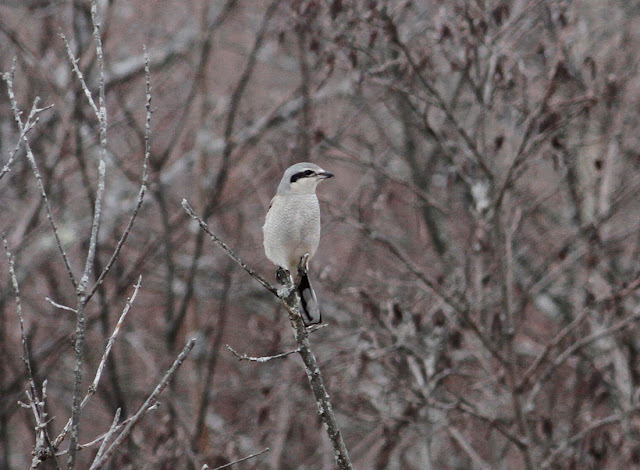 Here some images of the bird, all taken on February 17th, 2016 at Unity Park, Turner's Falls, Franklin Co., MA. This last shot is the only other adult Nelson's Gull that I've seen relatively locally. 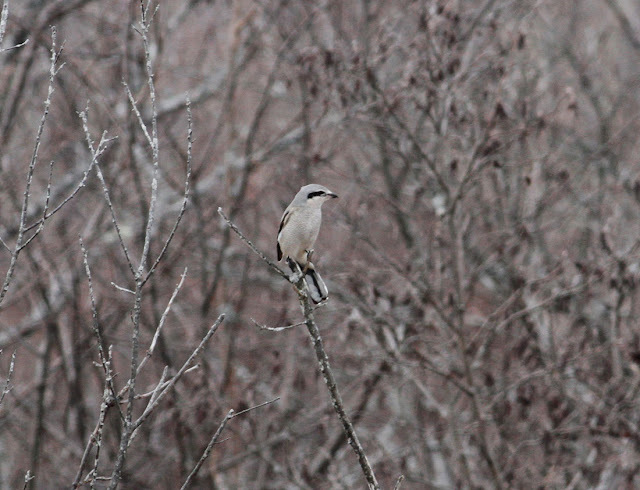 It was at the Windsor/Bloomfield Landfill, CT on March 4th, 2009. 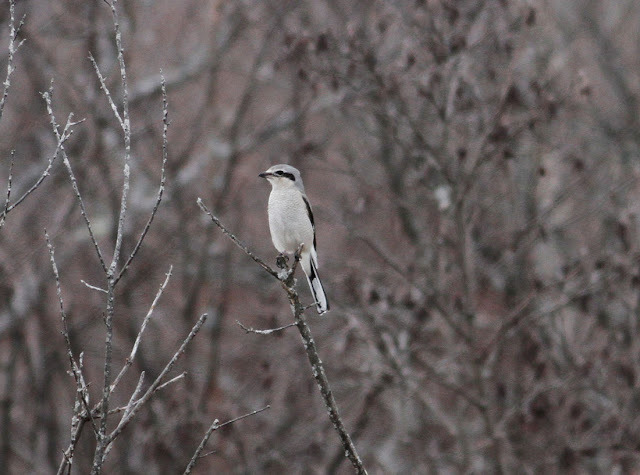 Had a quick spin around Turner's Falls this morning finding my first Fish Crow of the spring close to the breeding site near Cumberland Farms gas station, and then an enormous flock of 335 Cedar Waxwings at Unity Park. No Bohemians that I could detect but study of the photos might turn one up. 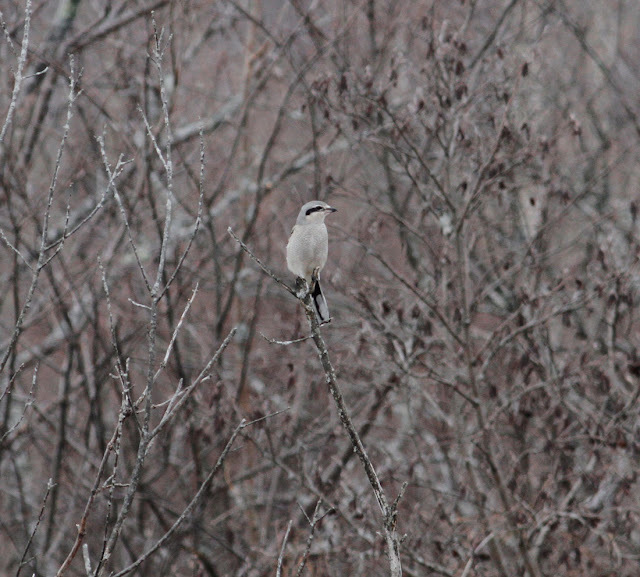 Certainly, I didn't hear anything other than Cedar Waxwings calling. 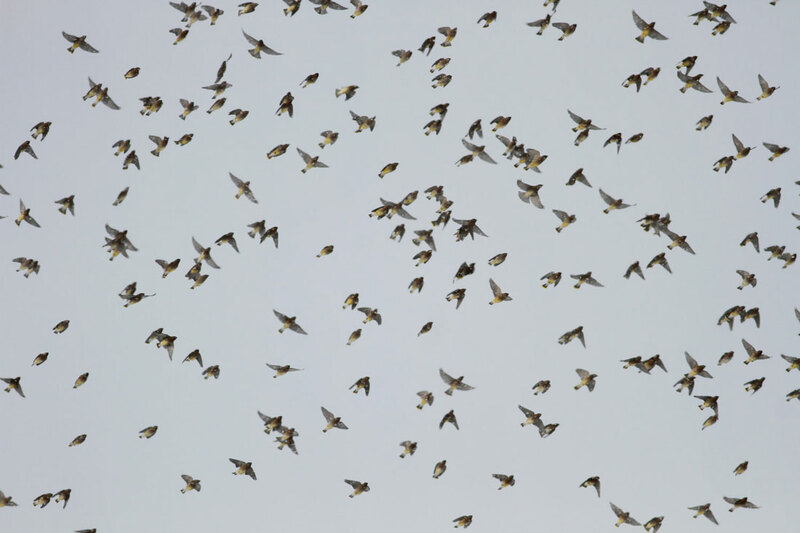 Most of the flock headed for downtown Turner's. 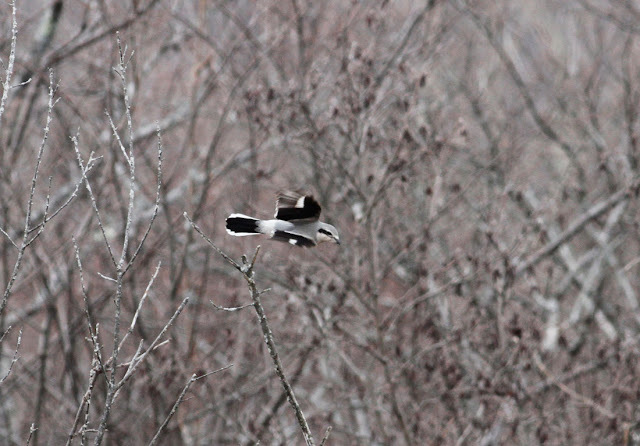 Cedar Waxwings - Unity Park, Turner's Falls, Franklin Co., MA. February 9th, 2016. 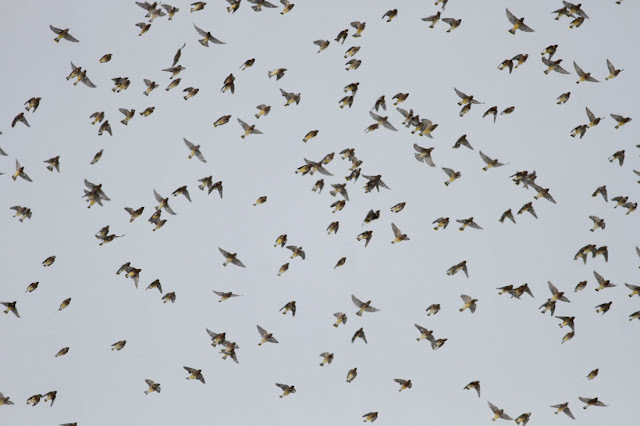 A small portion of the 335 counted, the largest single flock that I've seen in Franklin County. Bufflehead - male, Unity Park, Turner's Falls, Franklin Co., MA. February 3rd, 2016. 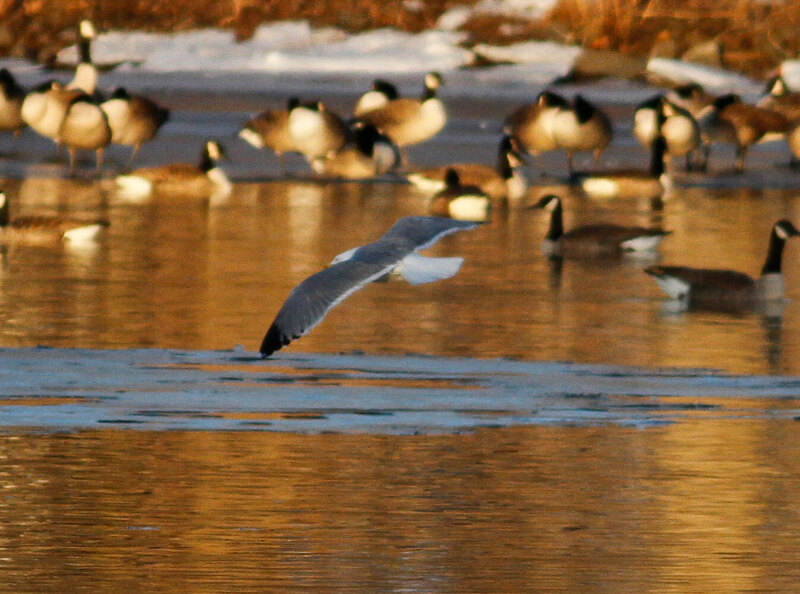 Nice drake lingering since Feb 3rd. Other than that, almost no gulls present but a few long staying ducks including the female Lesser Scaup (since Jan 6th) and the drake Bufflehead (since Feb 3rd). Nice to be looking at something other than gulls! 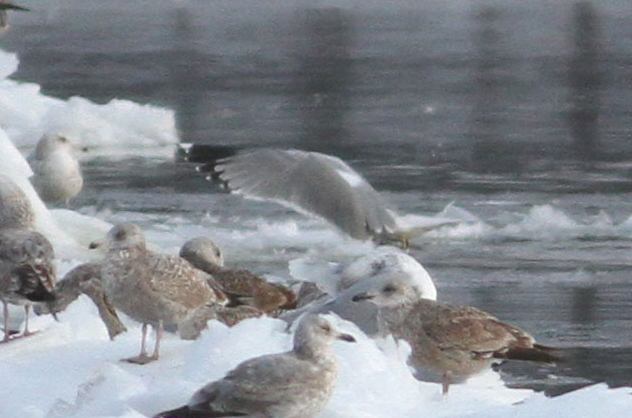 Yellow-legged Gull or hybrid - adult, Turner's Falls, Franklin Co., MA. February 1st, 2016. 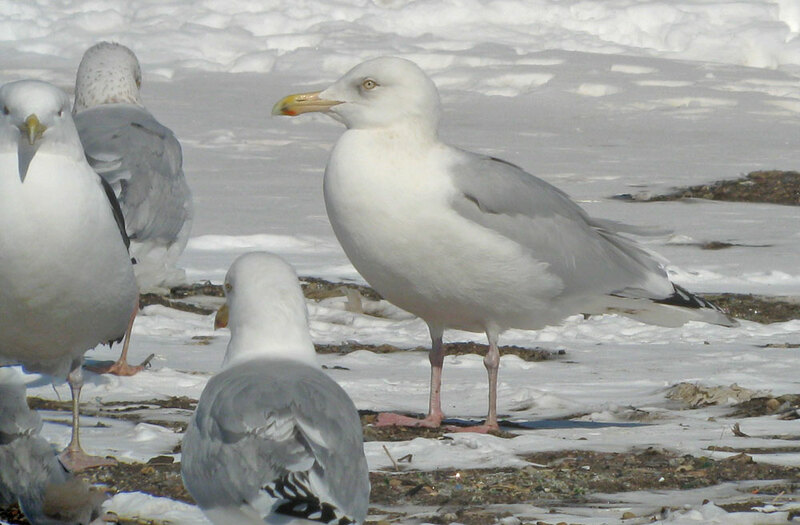 Update: February 15th, 2017; despite the compelling appearance of this bird I have decided not to submit the record to the Massachusetts Avian Records Committee. I received an incredible amount of feedback and I'm very grateful for all of it. Yet despite this, and after a lot of research and correspondance, I was unable to find any diagnostic features that would remove the possibility of a hybrid or backcross (Lesser Black-backed Gull x American Herring Gull). Unfortunately, I have no real choice but to leave the identification unresolved. 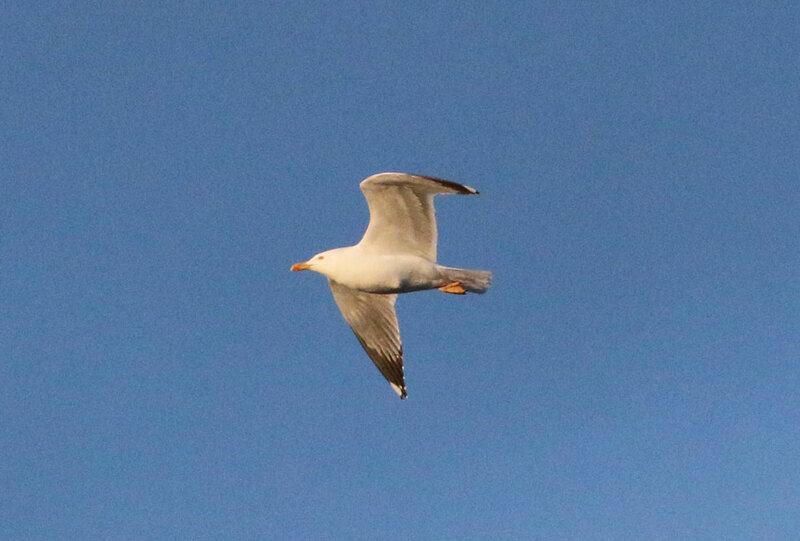 Update: March 30th, 2016; the broad consensus from European commentators suggests that this gull is "spot on for nominate michahellis", probably a female. Some commentators from the US have, to a large extent, been more reserved finding it impossible to rule out a perfect hybrid. If it is michahellis, then the bar for acceptance would have to be very high as it's potentially the first adult michahellis to be recorded in the Western Hemisphere. The MD/DC record from the early 90s was apparently never assigned to subspecies and I've been unable to find any record of an adult michahellis from North America - all the Quebec/Newfoundland records, to my knowledge, have been identified as atlantis. 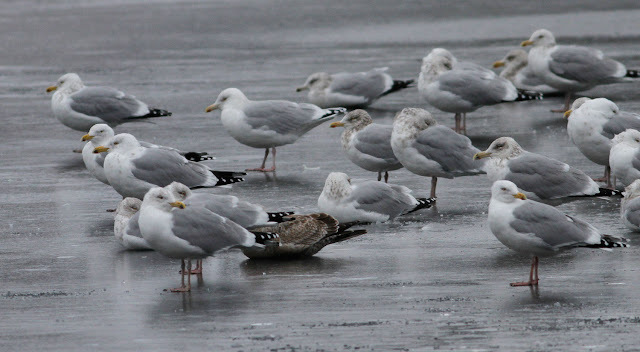 We're now looking for diagnostic features to separate Yellow-legged Gulls from difficult hybrids, and some of the latter appear to be very tricky indeed. Yellow-legged/hybrid Gull (center) - adult, Unity Park, Turner's Falls, Franklin Co., MA. February 9th, 2016. 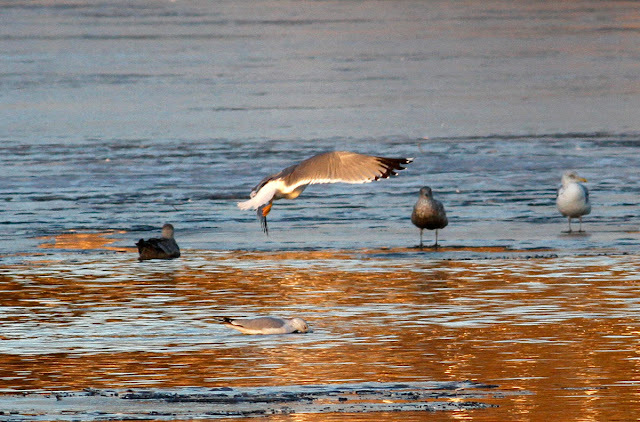 Clean-headed bird in center with bright mustard-yellow legs. Courtesy of Keenan Yakola. 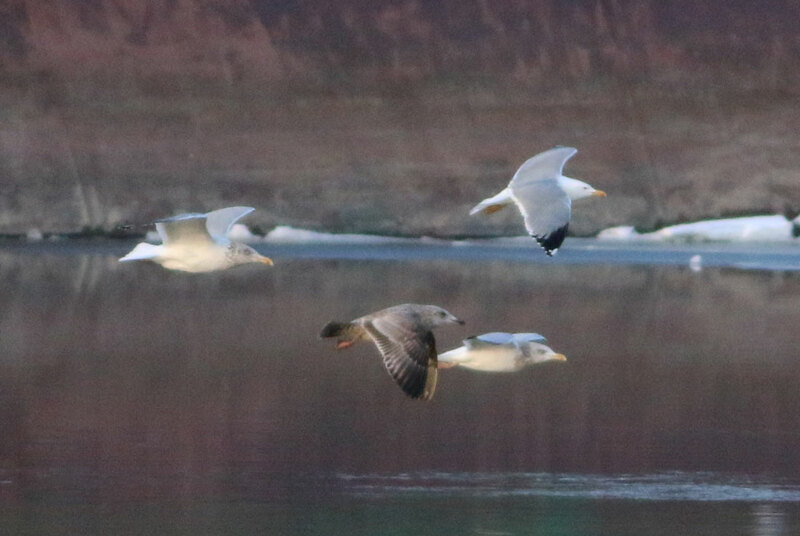 Update Feb 19th: The last confirmed sighting of the Yellow-legged/hybrid Gull was on February 10th but yesterday I was surprised and delighted to receive this superb set of flight images from Keenan Yakola . All the images were taken on February 9th between 16:20 and 16:30 hours at Unity Park. The images appear here with Keenan's permission and maybe well be the best flight images that we've seen to date. Record shot showing leg color in late afternoon. 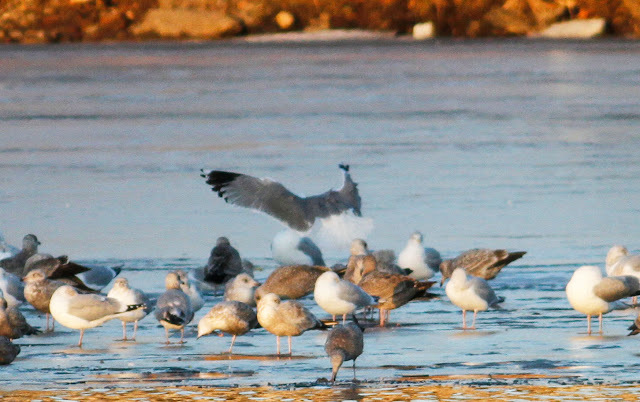 My impression, having watched the bird for some time on Feb 9th, was that the leg color had brightened since the first day on Feb 1st. 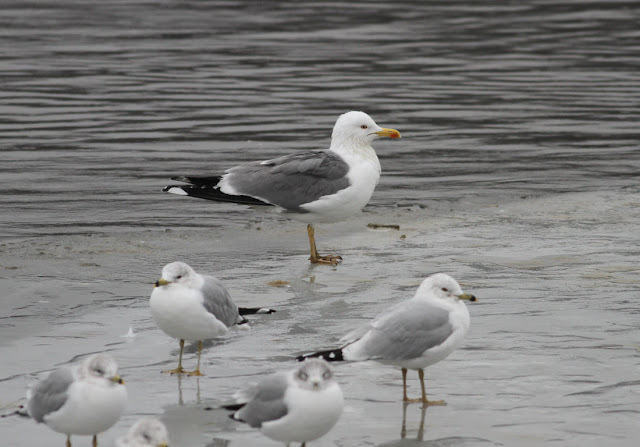 Yellow-legged/hybrid Gull - adult, Unity Park, Turner's Falls, Franklin Co., MA. February 9th, 2016. All images above appear courtesy of Keenan Yakola. Thanks Keenan! 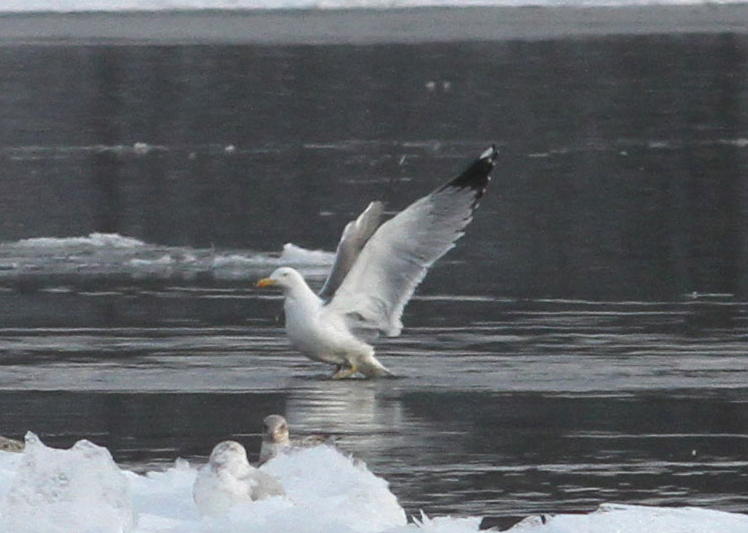 Yellow-legged/hybrid Gull - adult, Unity Park, Turner's Falls, Franklin Co., MA. February 1st, 2016. White-headed, darker mantled bird in center with mustard-yellow legs. Update Feb 15th: Still very cold at Turner's Falls but not quite as brutal as the previous two evenings. 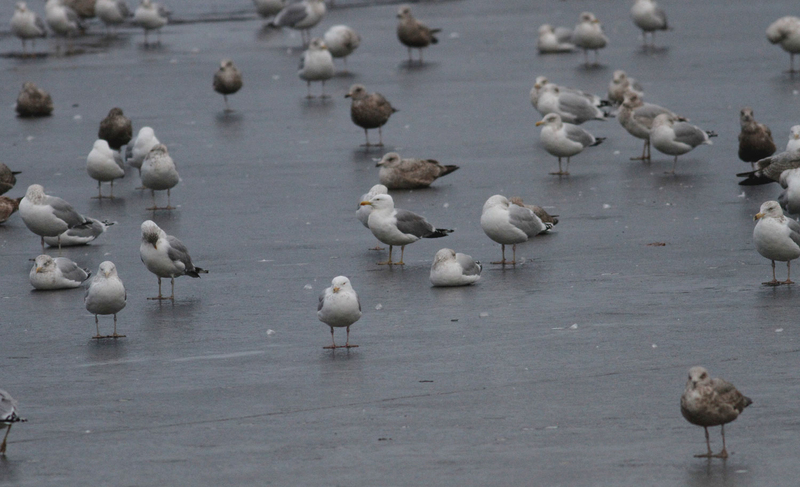 No sign of the Yellow-legged Gull once more, and again only 65 or so large gulls appeared at the roost. 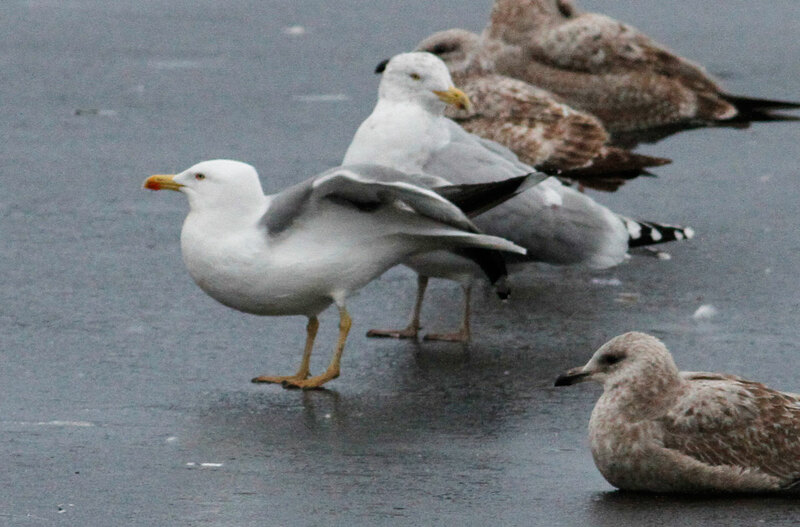 Probably my last entry on the Yellow-legged Gull unless it reappears in the forthcoming days. Feb 14th: The frigid spell continues with temps in the single digits and wind chills making it feel much colder, about - 12 F this afternoon. 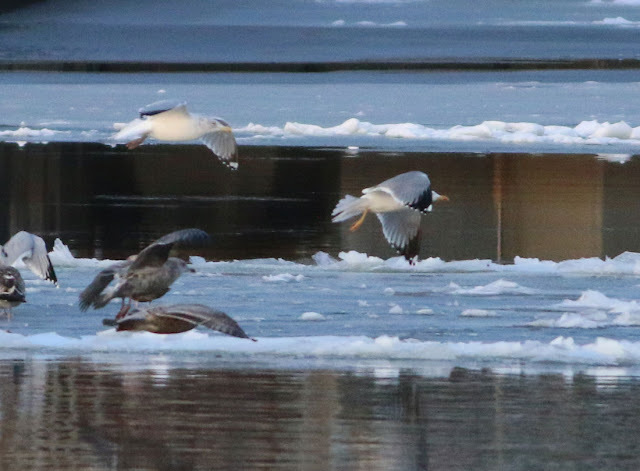 Almost all of Barton Cove above the dam is frozen with only a tiny handful of gulls roosting on the ice. 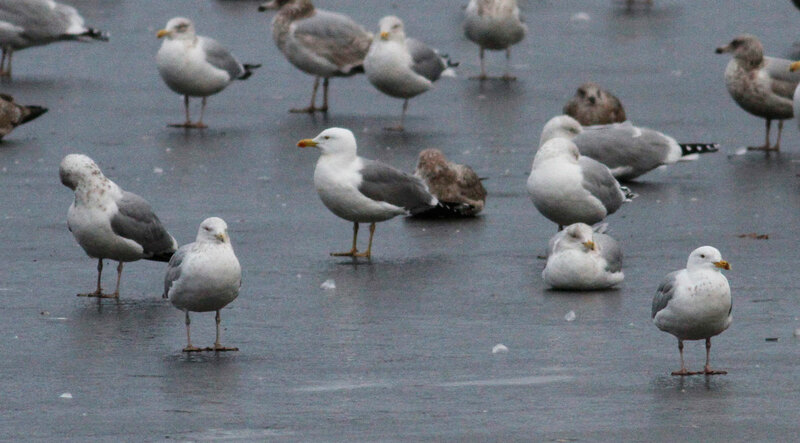 The Yellow-legged Gull was not among them and has not been confirmed since Feb 10th. 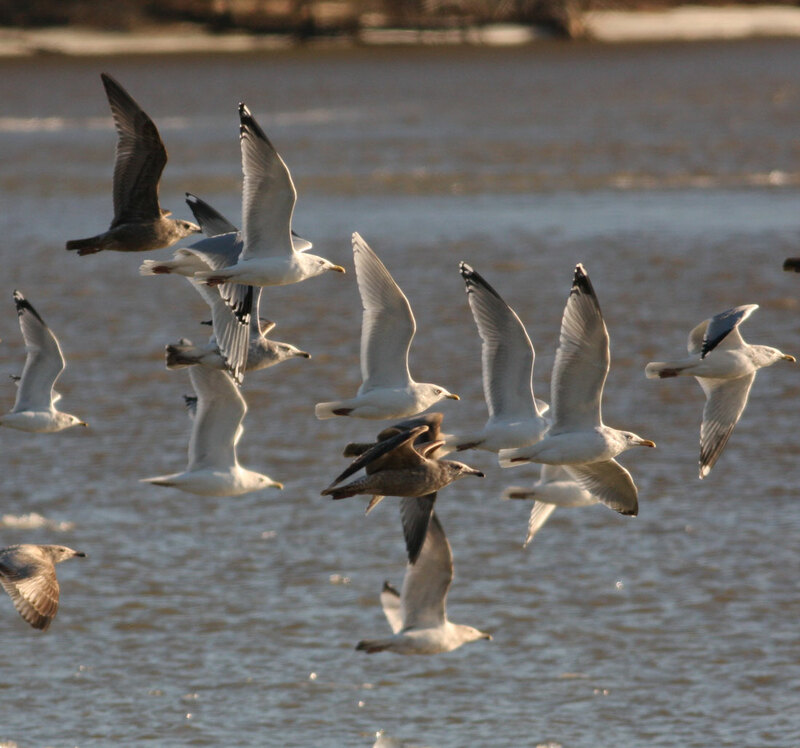 The cold spell is forecast to ease up by the early part of next week so it should be interesting to see if the gulls return to their usual routine once we get this cold spell behind us. Yellow-legged/hybrid Gull - adult, Unity Park, Turner's Falls, Franklin Co., MA. February 7th, 2016. Feb 12th: Frigid conditions again with about 95% ice cover at Barton Cove/Unity Park. The subject bird was again a NO SHOW but this didn't deter at least five birders from sticking it out and waiting for the roost to come in. 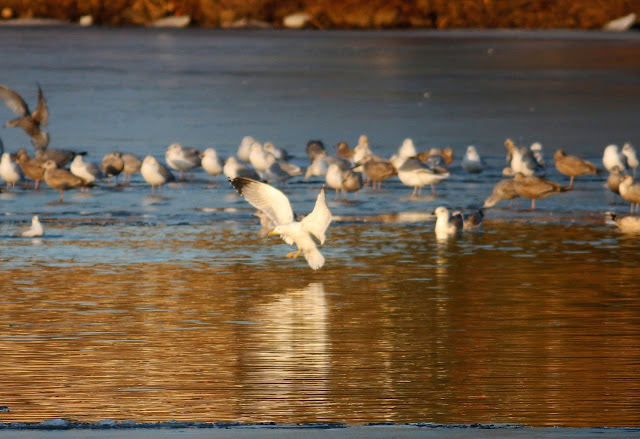 The birds never did arrive leaving less than 90 large gulls in a tight cluster on the ice. 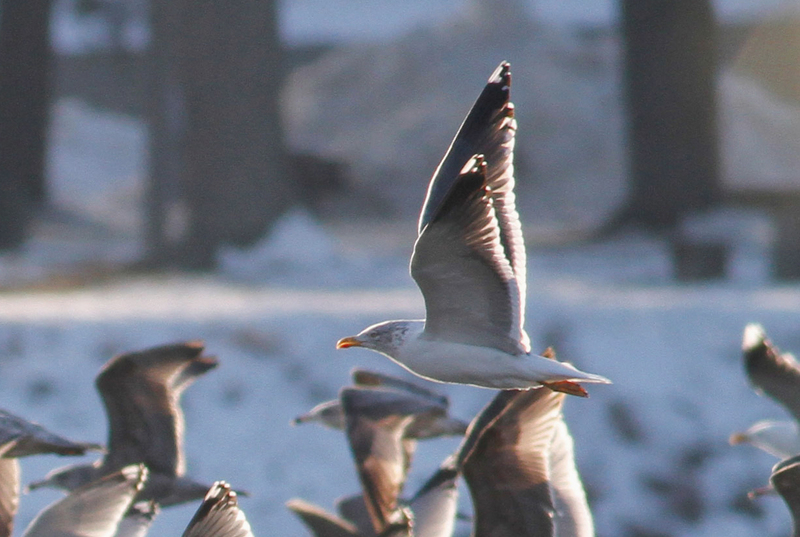 On the plus side, the second-cycle Lesser Black-backed Gull was present again offering nice close views and good photo opportunities. 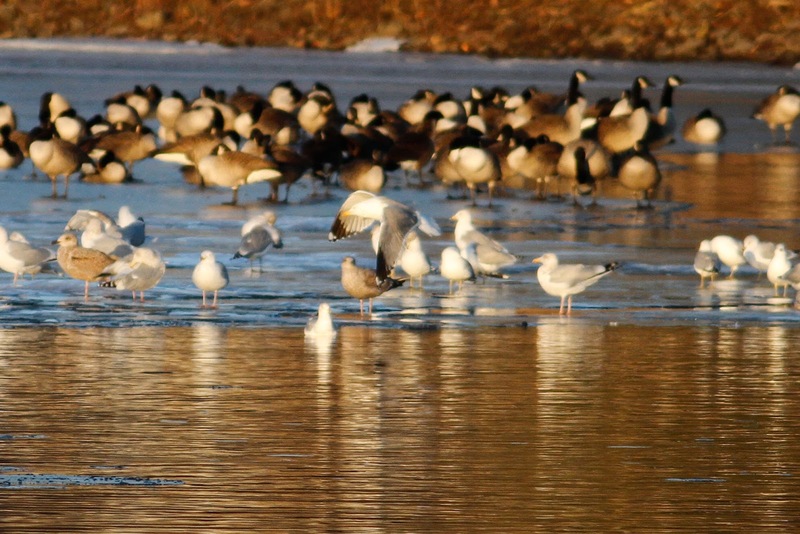 We don't know of an alternate roosting place at the moment. 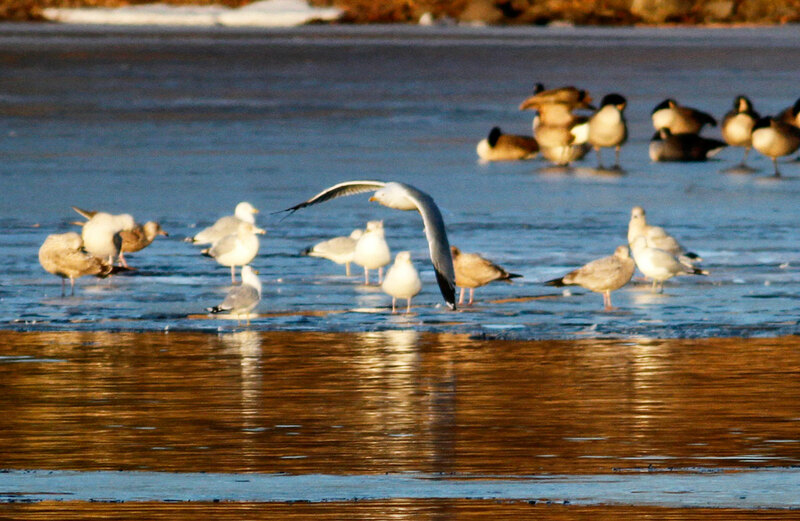 The power canal, for example, was devoid of gulls when checked but this doesn't mean that the birds have moved on. They could come back to the Turner's roost at any point. In addition, Bald Eagles have increased hunting activity, perhaps due to the extreme cold and the gulls won't stick around if they're being harassed by eagles. Feb 11th: the subject did not show up this evening. 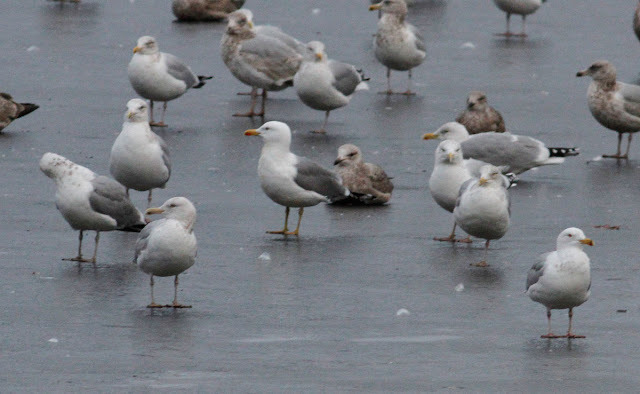 I was in the area from 15:25 hrs and gull numbers never rose above 150 birds meaning that 400 large gulls either moved out altogether or roosted elsewhere. The Arctic blast forecast for this week had already started with strong NW winds and a rapid temperature drop. 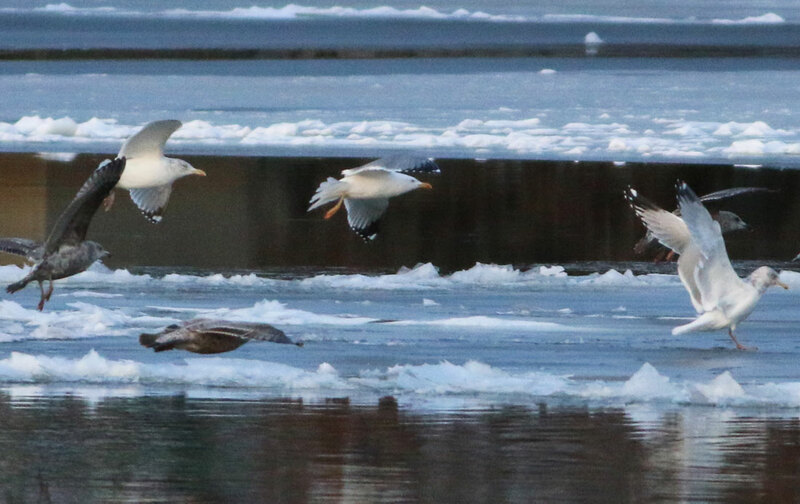 Most of Barton Cove will likely freeze in these conditions leaving very little open water and this could have an impact on where the gulls choose to roost in our area. 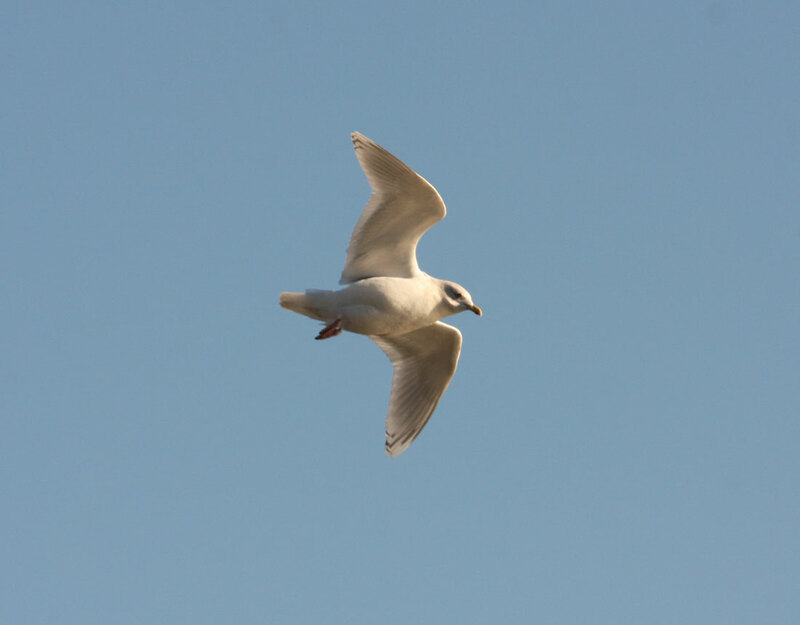 Feb 10th: this afternoon the subject bird was filmed and photographed by Patrick Comins from 4:15 pm onwards. 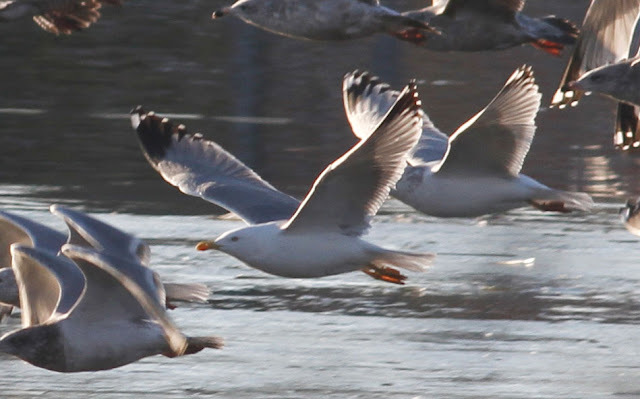 Images and some video can be seen on the North American Gulls Facebook page. 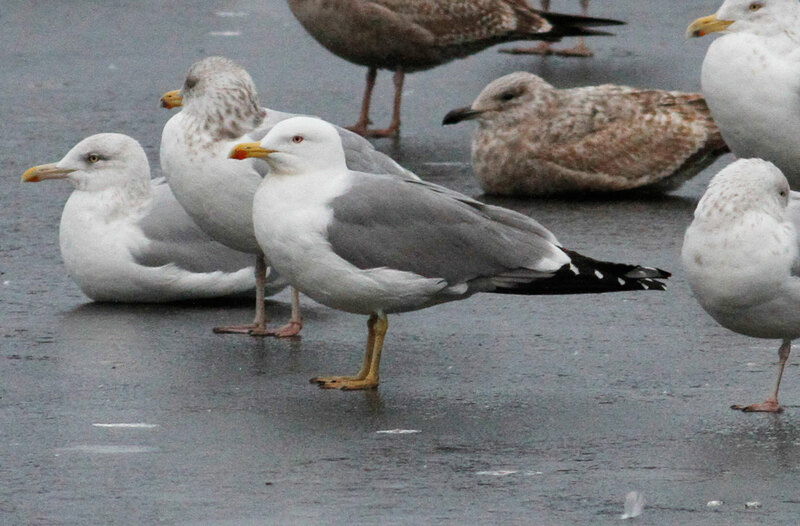 I would urge anyone with an interest in gulls to go and look for this bird! Feb 9th: the 'Yellow-legged Gull' was already in view when I checked Barton Cove, Gill at 3pm. 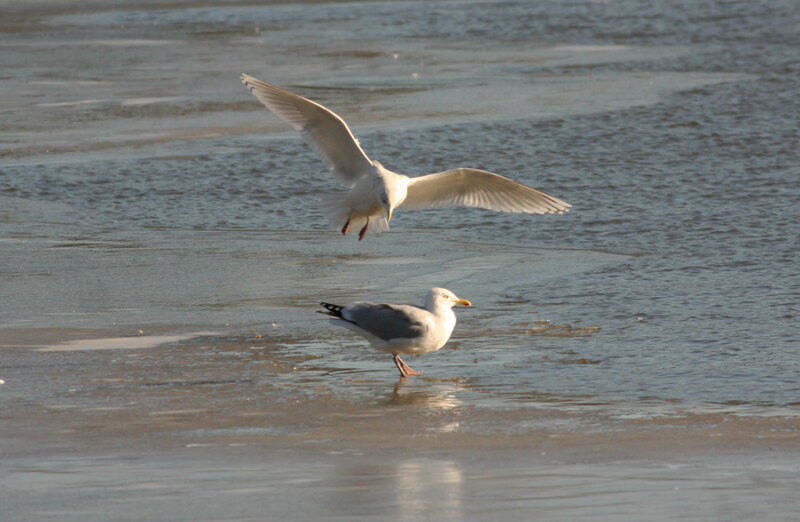 Small numbers of gulls were feeding on the mud exposed by low water levels this afternoon and I/we enjoyed excellent though distant views for sustained periods. In fact it was in view all the way through until dusk. The bird spent sometime bathing allowing for shots of the open wing, a little distant and grainy perhaps but at least something to add to the overall record. 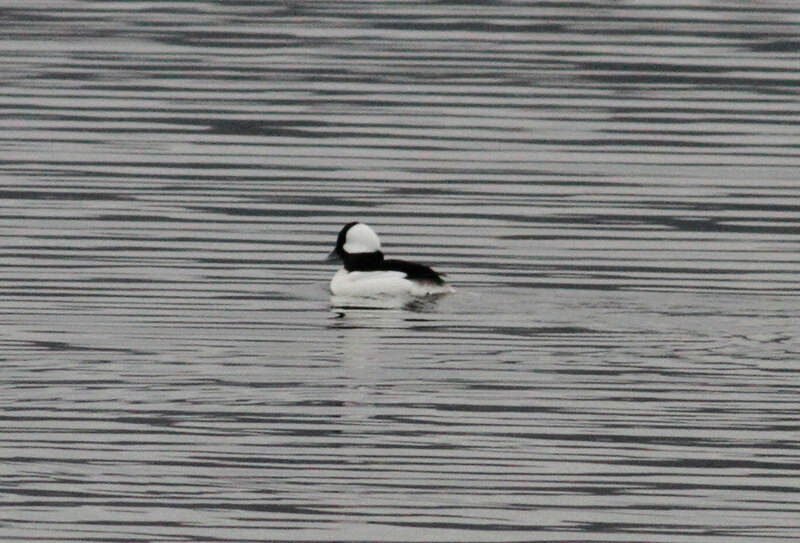 Still quite a few birders out and about looking for this lovely bird. Also two Lesser Black-backed Gulls this evening, one adult-winter and one 2nd-cycle. 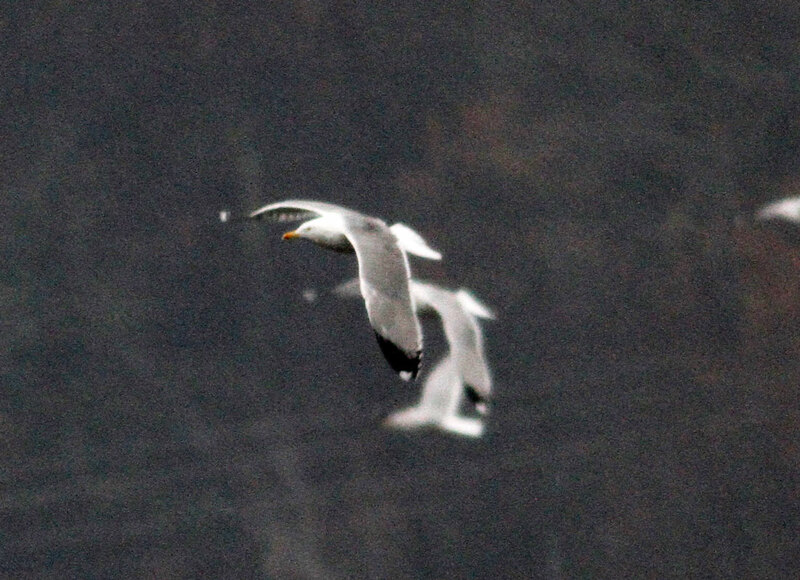 Feb 8th: the subject bird arrived late to roost once more and flew in with a small group of Great Black-backed Gulls at around 16:45 hrs, a real shame because I put in a sustained watch from 15:00 hrs on the Gill side when viewing conditions were pretty good (100% cloud cover with fresh fresh snow atop the ice). 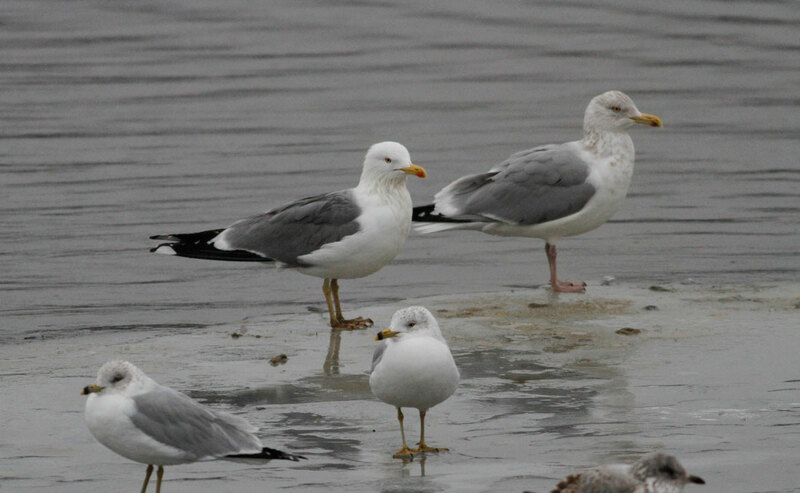 The adult Lesser Black-backed Gull was present throughout this period but most notable was the increasing number of Herring Gulls showing clean, white-headed summer type plumage. I counted six such adults this evening after noting my first on Feb 3rd. 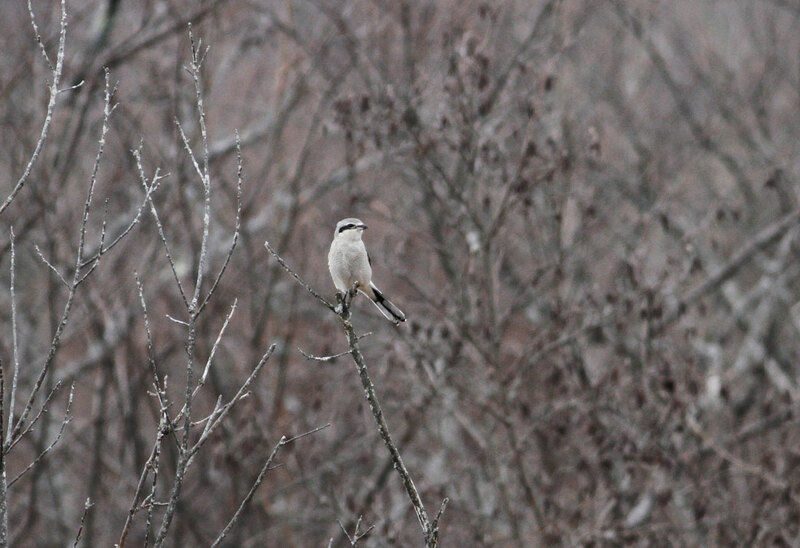 The white-headed appearance of the subject is looking less and less remarkable, and is no longer so reliable as a visual cue. Feb 7th: lots of field reports of the subject gull today from early afternoon through to sunset. I caught up the bird at around 16:00 hrs on the Gill side of the river and watched it through to about 16:45 hrs. 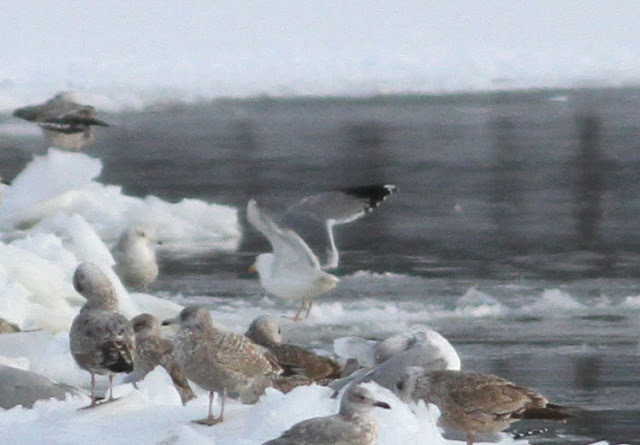 Apart from one short flight, it spent the entire time roosting though it was nice to see it close to a Lesser Black-backed Gull. 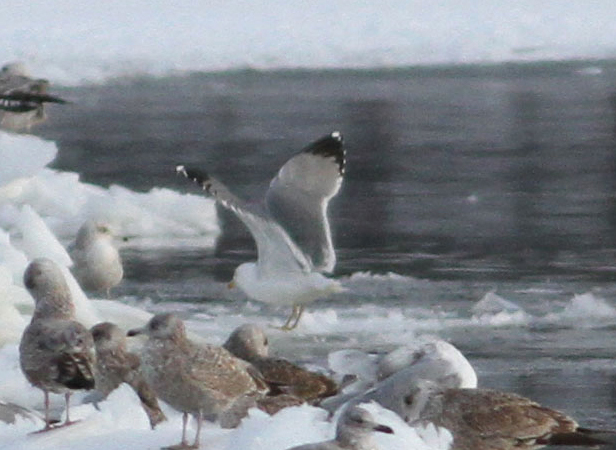 Yellow-legged or hybrid gull - adult, Gill, Franklin Co., MA. February 7th, 2016. Still proving difficult to get close to. Leg and foot color is distorted by strong late afternoon back-lighting. 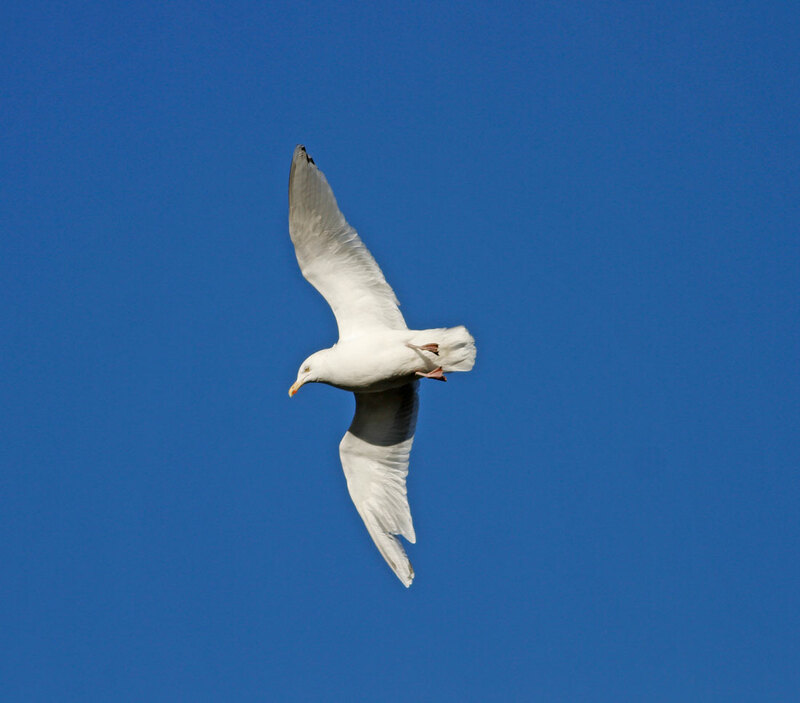 This is the right bird! 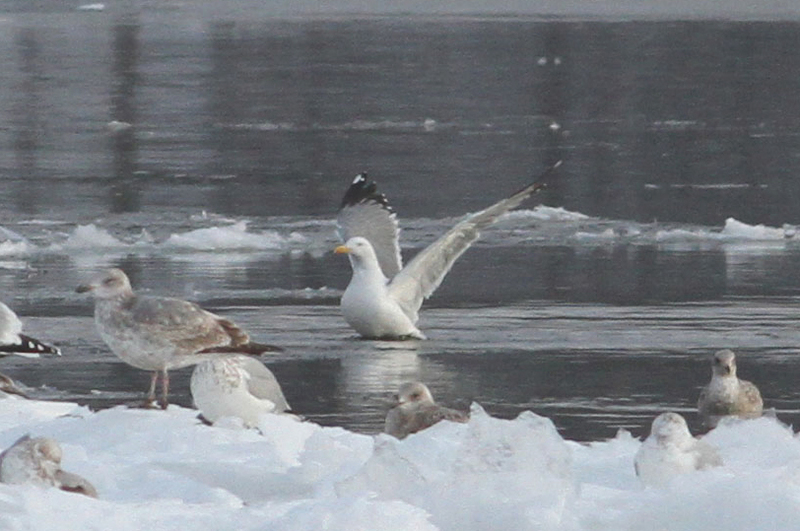 Yellow-legged or hybrid gull - Gill, Franklin Co., MA. February 7th, 2016. Subject bird is extreme left, Lesser Black-backed Gull at extreme right among American Herring Gulls. Lesser Black-backed Gull - adult, Gill, Franklin Co., MA. February 7th, 2016. 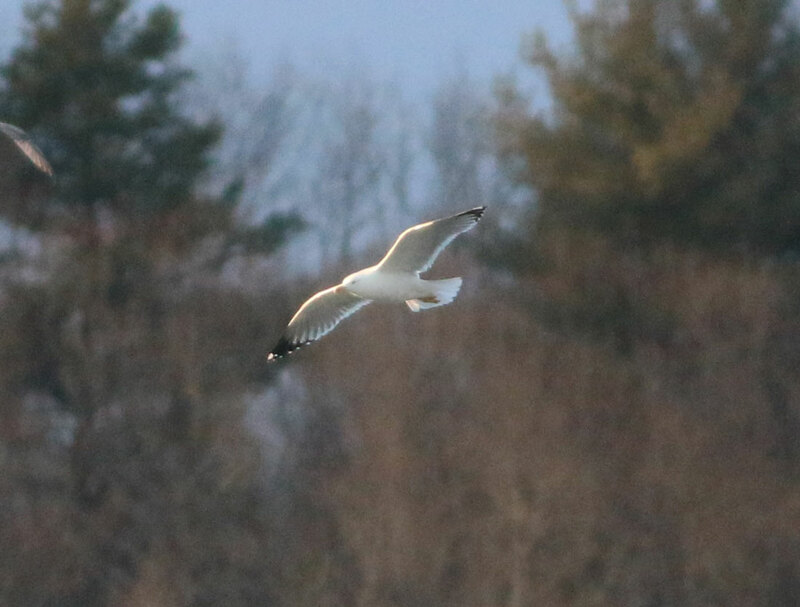 Feb 6th: there was still plenty of interest in searching for this bird, and that's despite multiple observers expressing concerns over the head and bill shape, wing length and leg length. 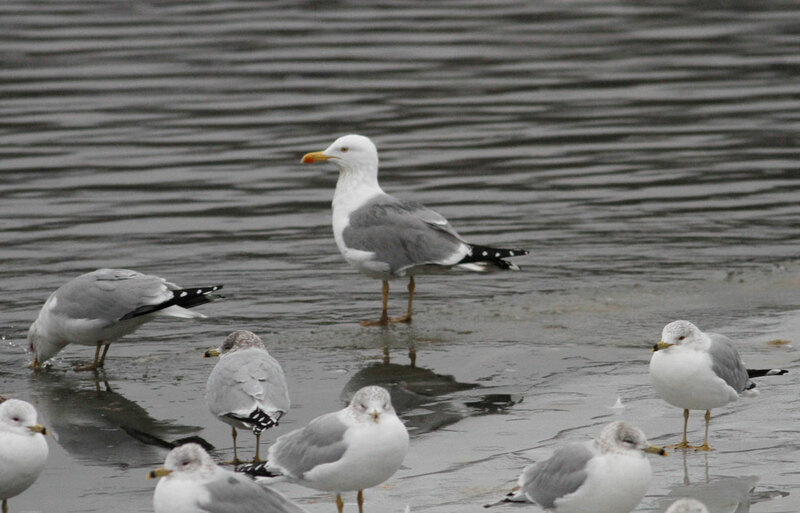 Collectively these features may be more in keeping with Lesser Black-backed Gull and thus point more towards a 'nightmare hybrid'. Of course, this has been my concern from day one (scroll down to see my original comments from Feb 1st). 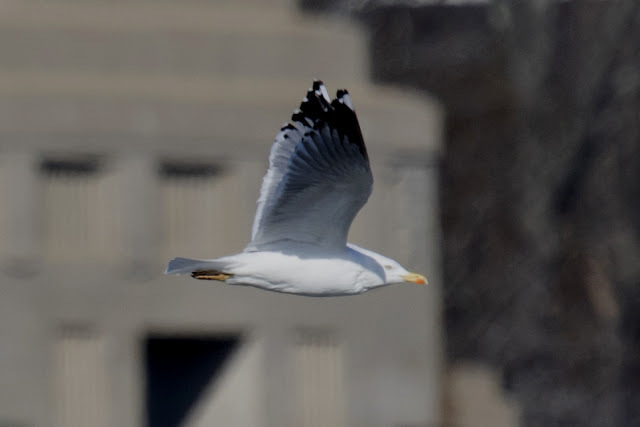 However, at least 40 birders could be seen checking the gulls resting above the Turner's Falls dam this evening. No one saw the subject bird fly in but it probably arrived with the last group of gulls to land on the ice at about 17:30 hrs. 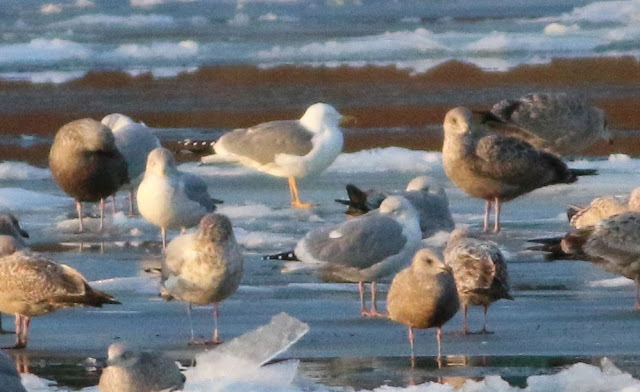 We'd all just about given up when birders from Long Island, NY spotted the bird with just enough light to discern the features with the exception of leg color. Kudos to Arie Gilbert for finding and drawing attention to it - I'm sure it would have been missed otherwise. 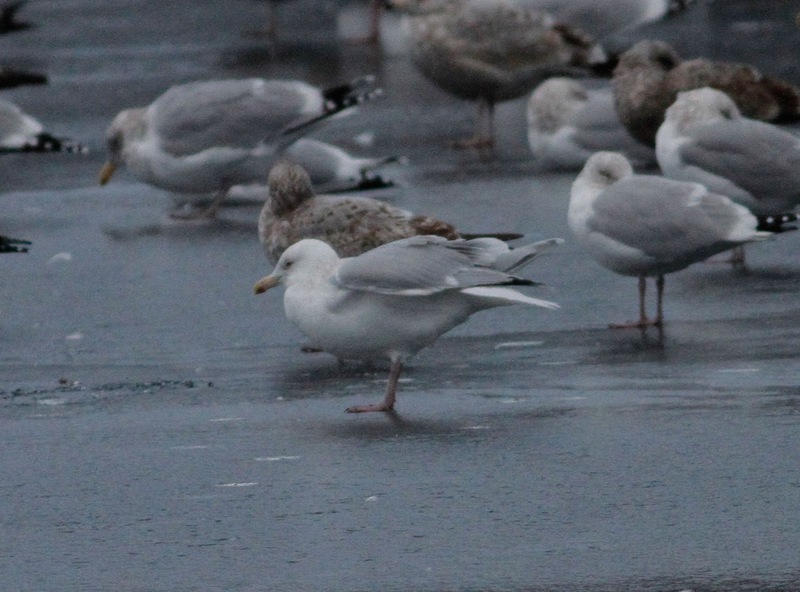 Feb 5th: the subject gull did NOT show up this evening, much to the disappointment of 45 or so assembled birders. It appears that today's snowstorm may have had a effect on all the gulls at Turner's Falls as the numbers were well down on the previous four evenings. 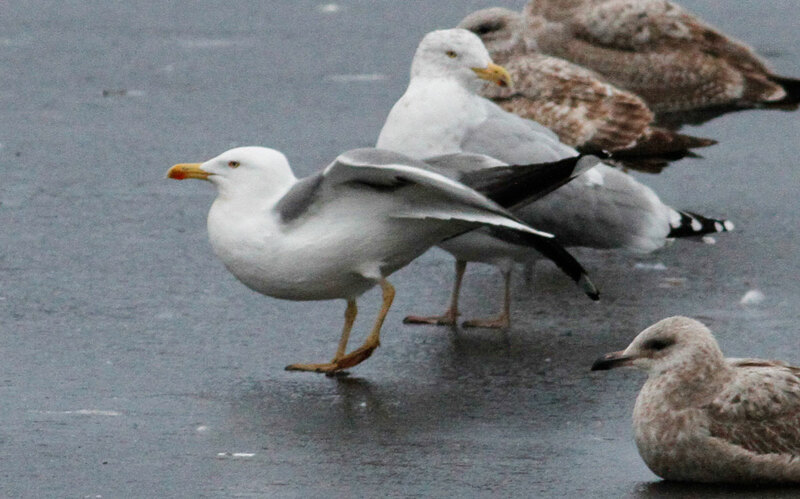 In addition, a compelling post from Dani Lopez Velasco on the North American Gull Facebook page was highly suggestive that this fantastic looking bird (to us) may not be quite right for a typical Yellow-legged Gull and refers to two odd features - the long-winged and short-legged appearance perhaps indicating a Lesser Black-backed Gull hybrid. As Dani says, you would want a state first to be perfect and any odd features should ring alarm bells. Well, the alarm bells are now ringing. Feb 4th: The subject bird arrived at Unity Park around 16:50 hours, much later that the previous three days. Well over 60 birders assembled and got their prize. 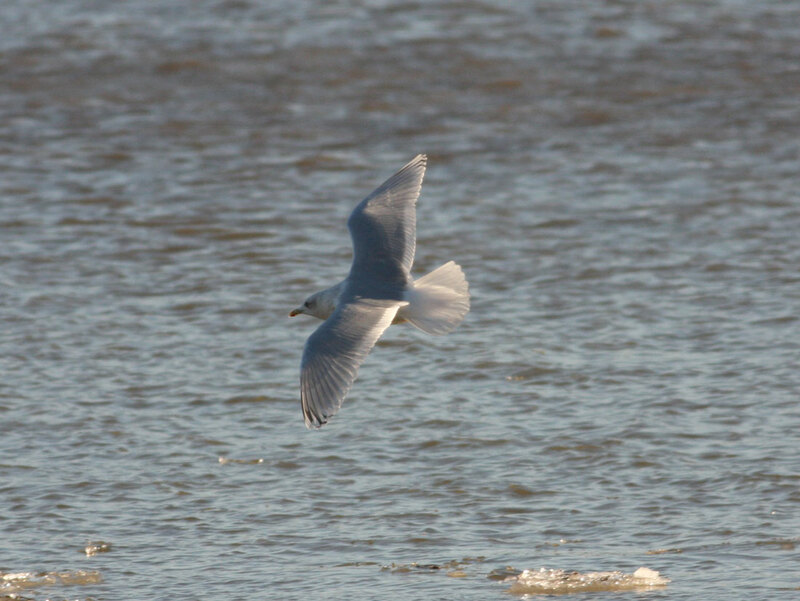 JoAnne Russo also managed this excellent record shot from the Gill side of the river. 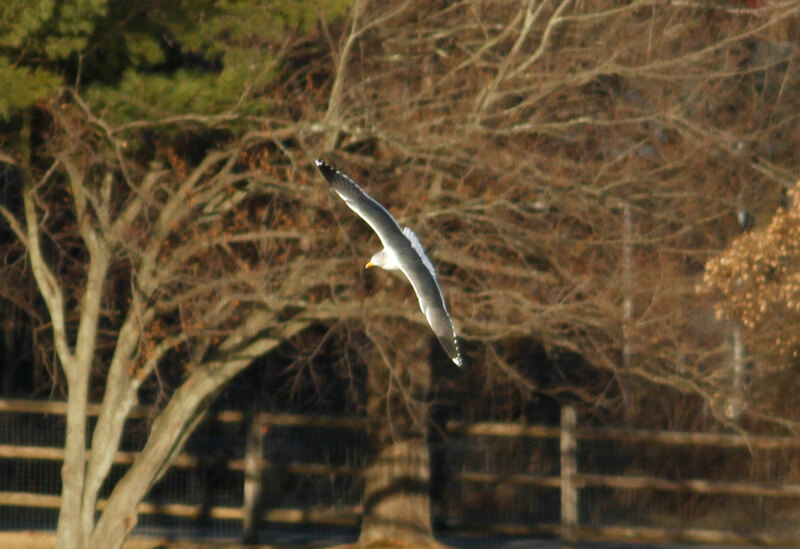 Yellow-legged or hybrid Gull - adult, from Riverview Drive, Gill, Franklin Co., MA. February 4th, 2016. Image courtesy of JoAnne Russo. 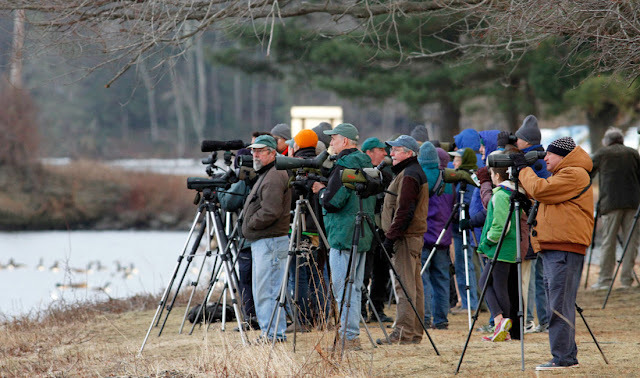 Remarkable scenes - Unity Park, Turner's Falls, Franklin Co., MA. February 1st, 2016. 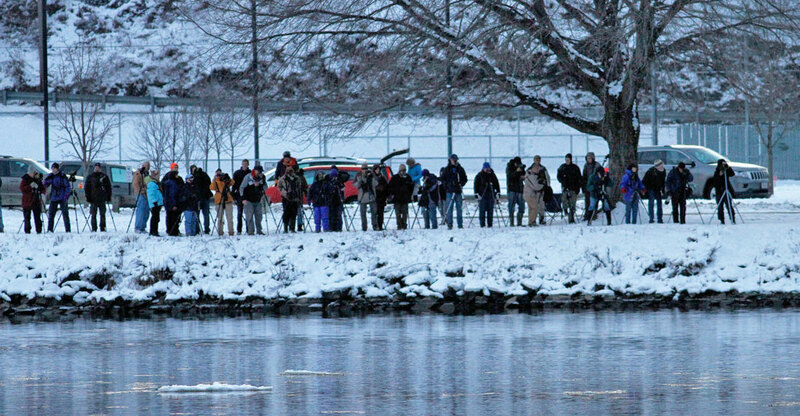 A small portion of the 60 plus birders scattered around the site this afternoon. Fifteen minutes later, they had their prize. Feb 3rd: the bird was seen twice today. First in very bizarre circumstances, I had a single large gull flying south with 150 Canada Geese over Munn's Ferry Road, Gill at 08:25am. 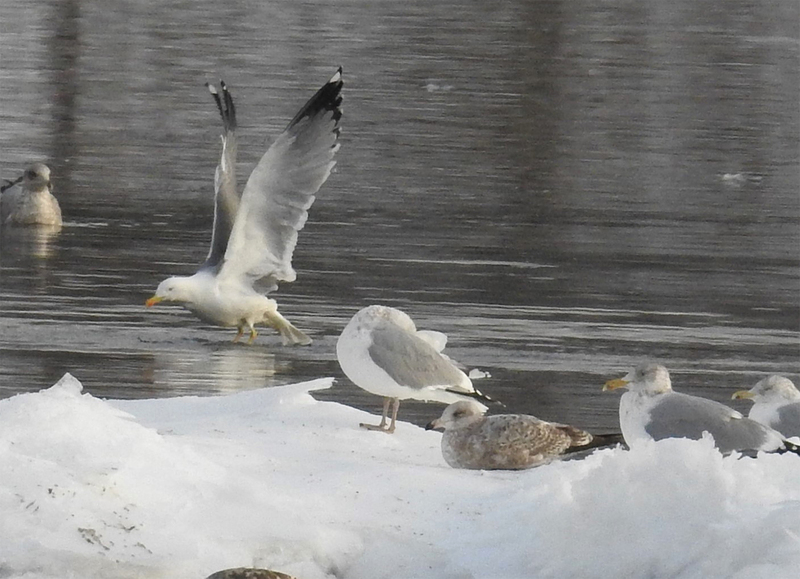 I only pulled over to take a quick look because all large gulls are exceedingly rare in rural Gill away from the CT river - it was the Yellow-legged Gull!! Attempts to relocate it (and the geese) did not succeed. 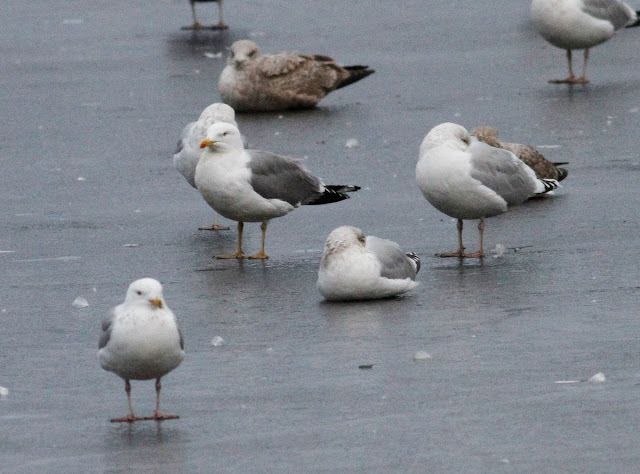 Later, in horrendously wet, cold weather the 'Yellow-legged' Gull was already sitting on the ice at Unity Park with Ring-billed Gulls at 15:25 hours. 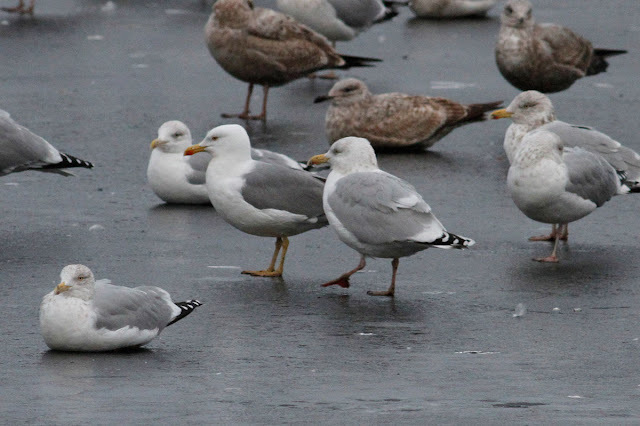 For some minutes it was the only large gull among the Ring-bills until more Herring Gulls started to arrive. About 550 large gulls came into Barton Cove in the evening including the continuing Lesser Black-backed Gull. 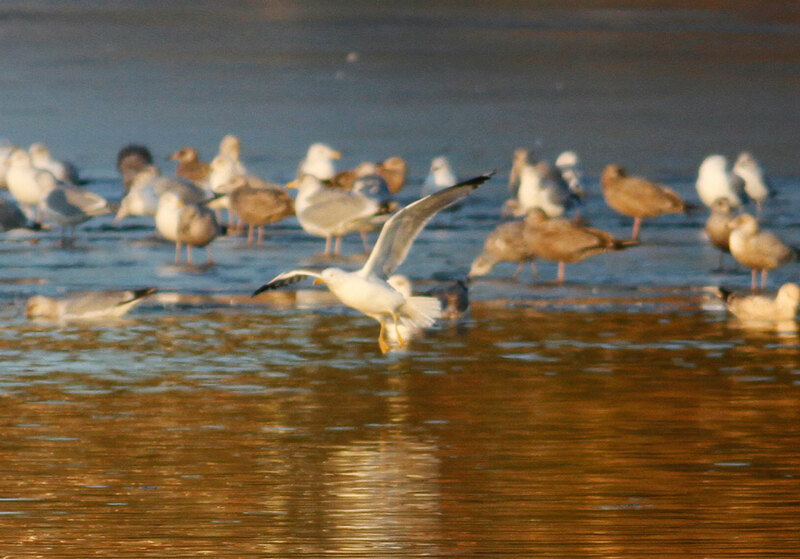 The subject bird repeatedly returned to Unity Park despite being frequently flushed by Bald Eagles. Feb 2nd: A small group of birders gathered at Unity Park this evening hopeful of seeing the subject bird. On the plus side, it was a lovely warm sunny evening. 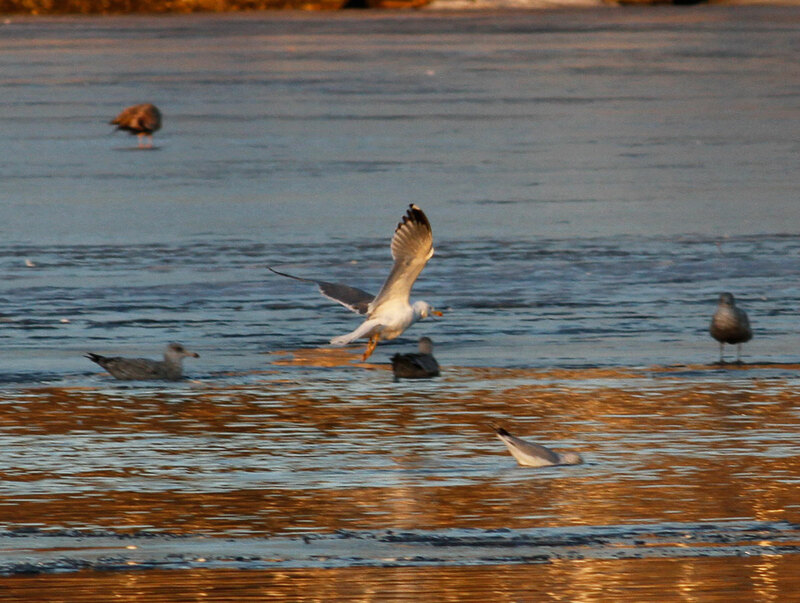 On the down side, the ice was much receded from the previous day so the gulls were father out on the river. 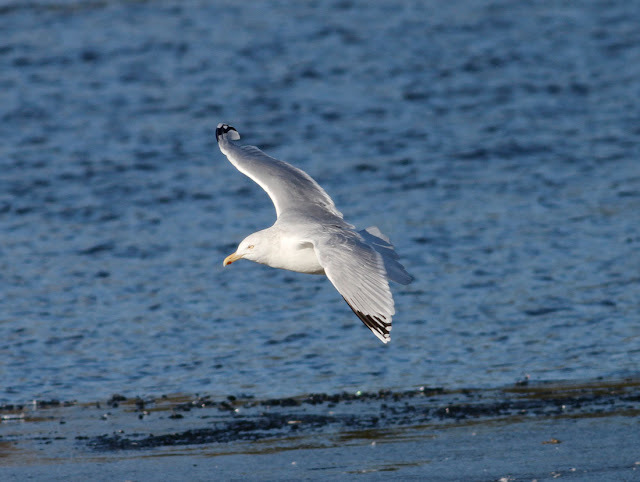 The regular adult Lesser Black-backed Gull had already been detected by the time I arrived at about 16:00hrs but the rest of the gull build was slow until JoAnne Russo picked up the subject bird sparring with a Herring Gull over a food item. 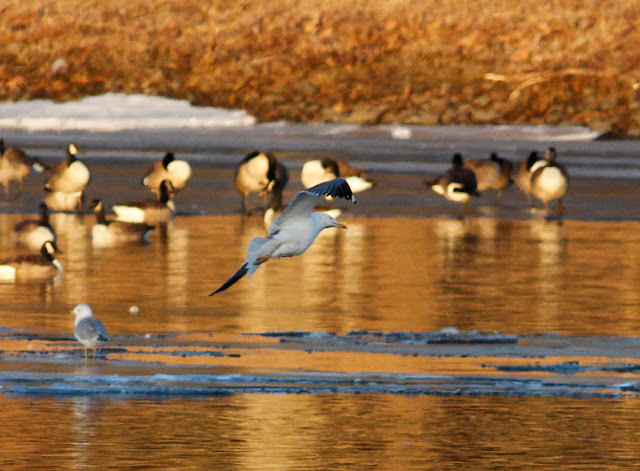 From that moment on, our small party had the bird in view until dusk when a Bald Eagle flushed the lot and they headed up river. 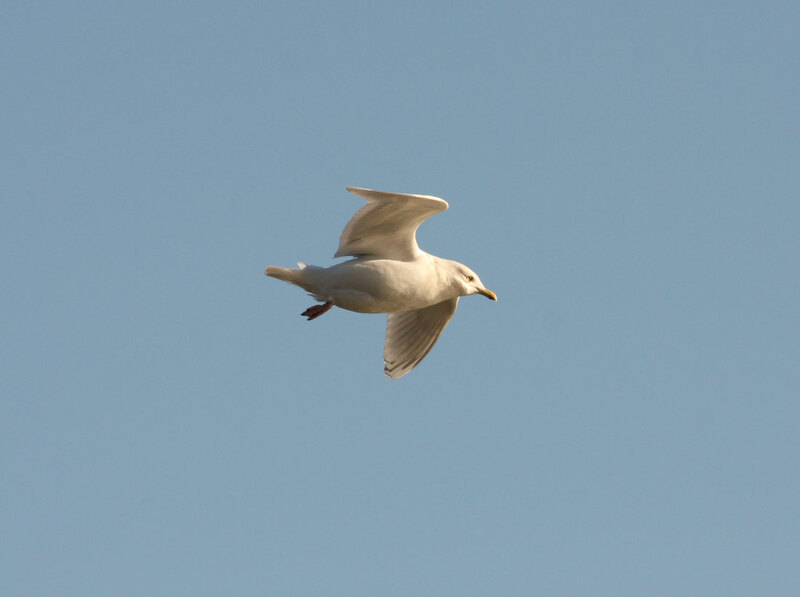 Key for us was the fact that the bird was much more active this evening allowing for some shots of the open wing to be taken, albeit distantly. Hopefully there's enough information contained within these images to make some progress on the overall identification -fingers crossed! 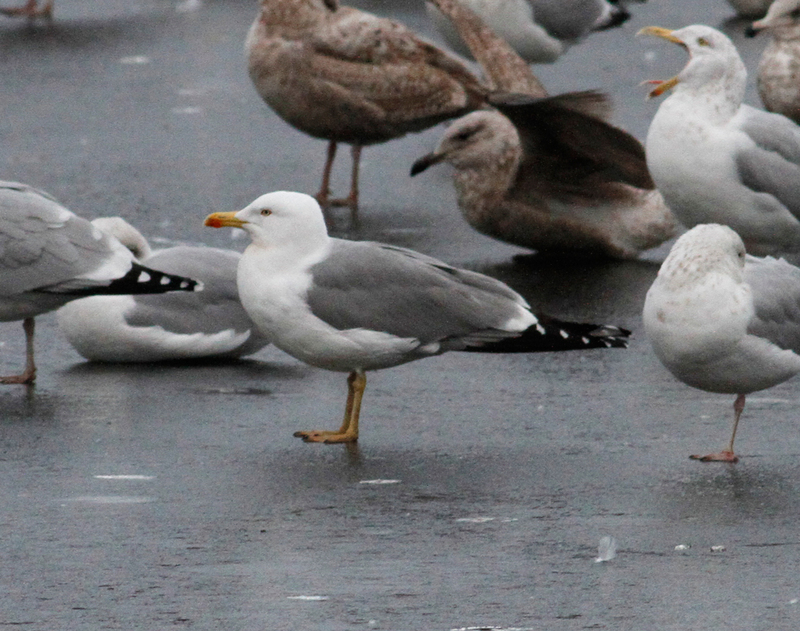 Lesser Black-backed Gull - adult present for comparison. Feb 1st: A ridiculously mild evening saw me down at Unity Park where my son and his friend were checking out the brand new skateboarding park. 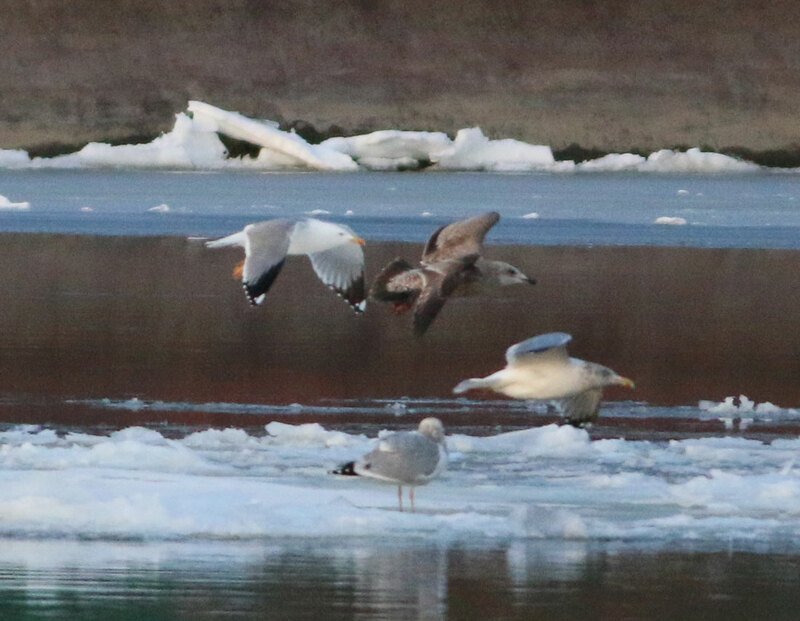 With another parent present I was 'allowed' to slip away for a few minutes to check out the gulls resting on the ice only a few yards off the bike path. 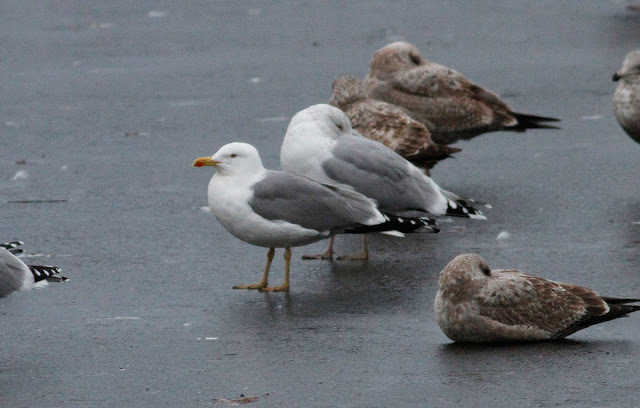 The first few scans produced nothing of interest, least of all the regular adult Lesser Black-backed Gull and Saturday's Kumlien's Iceland Gull. 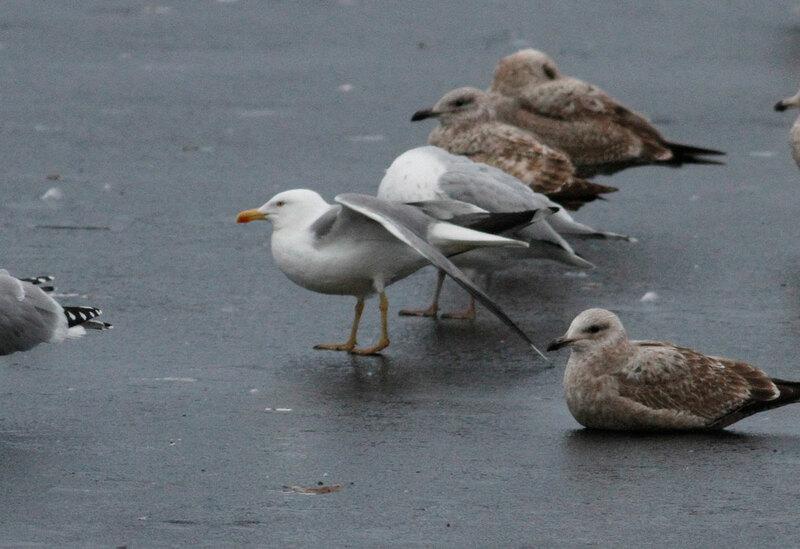 But a little later, one bird jumped out as being far different from the surrounding American Herring Gulls. It was clearly darker mantled than the adult Herring Gulls but was also obviously paler than the typical Lesser Black-backed Gull which I get to see almost every day at Turner's Falls in the winter. 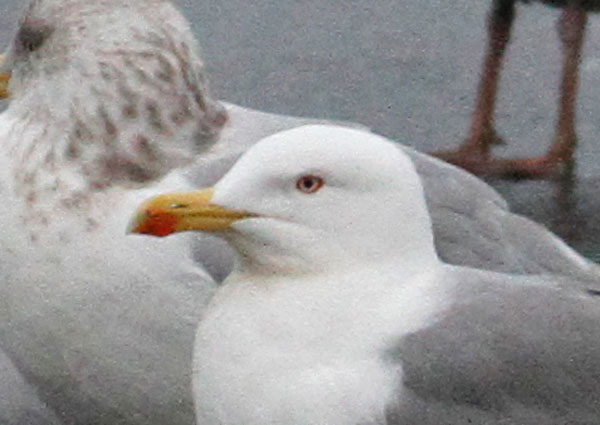 In addition, the head was gleaming white and clean, off-set against a bright egg-yolk yellow bill and particularly large bright red gonys spot. Overall, the bird looked immaculately clean. Finally I checked the legs which were certainly yellow, but appeared to be dull mustard yellow rather than bright yellow. The bird looked to be in full breeding plumage though I expected the legs to be brighter, especially if I was going to entertain thoughts of a Yellow-legged Gull! 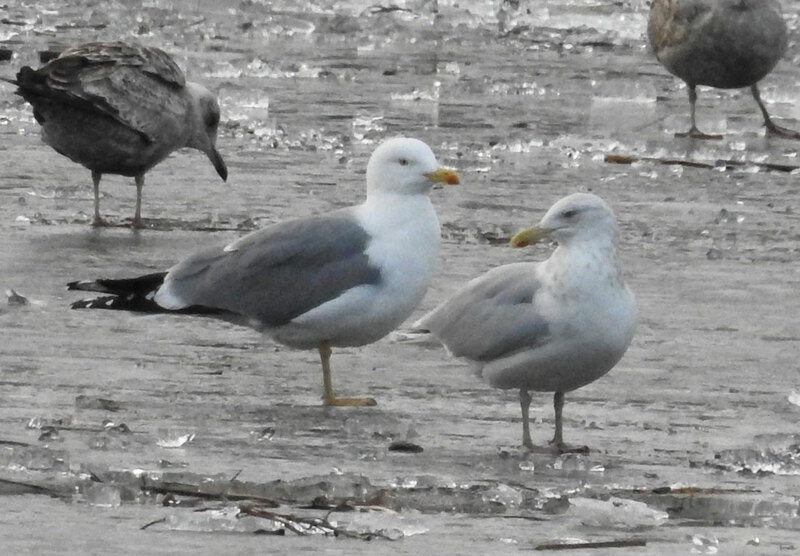 On the other hand, if I was sorting through Yellow-legged and Armenian Gulls on a beach in Northern Israel I doubt very much if I'd consider this bird to be a hybrid, especially from an American Herring x Lesser Black-backed Gull pairing! 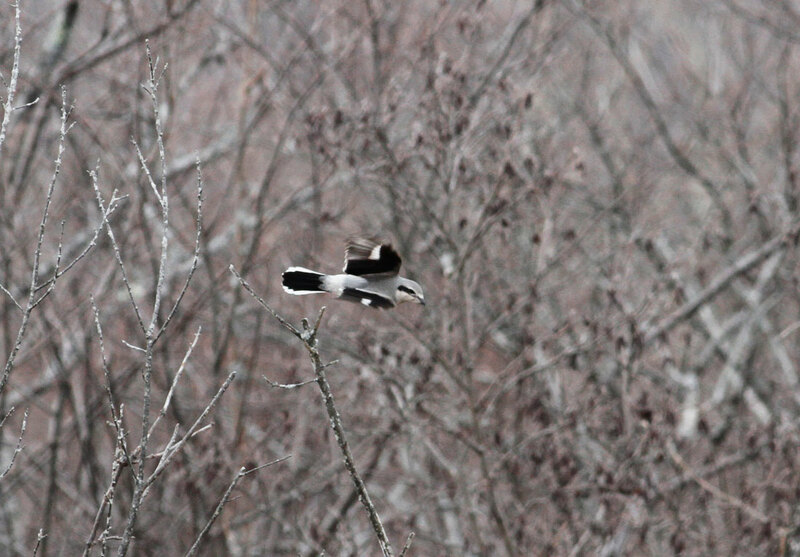 However, it was clearly a bird of interest and I began to take pictures. A little farther along the bike path I noticed that I'd been joined by another birder - it was Harvey Allen. I don't see much of Harvey at Turner's Falls but he has the uncanny ability to show up just as I'm in the middle of something interesting. We were able to share some pleasant minutes talking about the bird and I made sure that Harvey had good views through my scope. Not long afterwards, a new Kumlien's Iceland Gull showed up distracting us from the subject bird. Shortly thereafter a Bald Eagle flushed the whole flock which then spent the rest of the evening circling above Turner's Falls until it was almost dark. 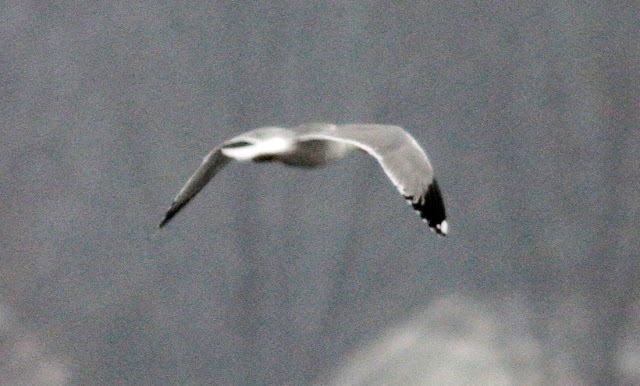 What to make of this gull? Well I just don't know at this stage. 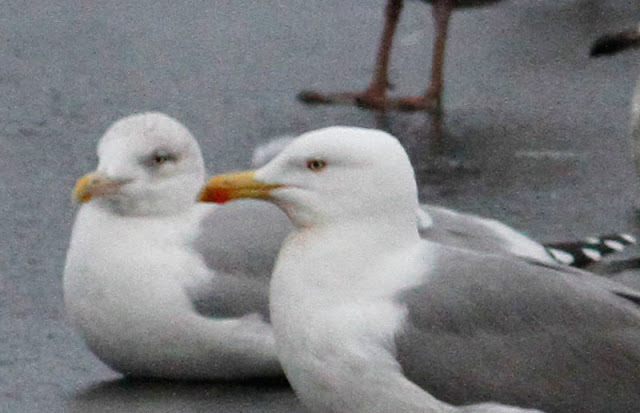 We do know that Lesser Black-backed Gulls are hybridizing to some extent with American Herring Gulls in the North-east and a 'perfect' hybrid seems (to me) to be much more plausible than a Yellow-legged Gull from the Mediterranean region of Europe. 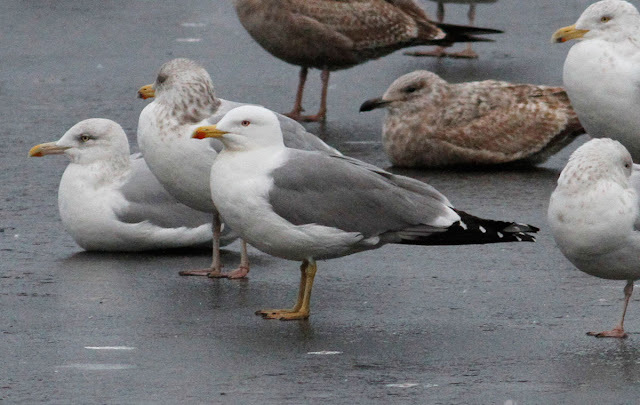 Another population of Yellow-legged Gull breeds in the Azores, a form which I've never seen, but should be rather more likely as a vagrant to eastern North America than the Mediterranean form. Either way, I don't expect to reach any firm conclusions with this first post but just wanted to get some images out there. 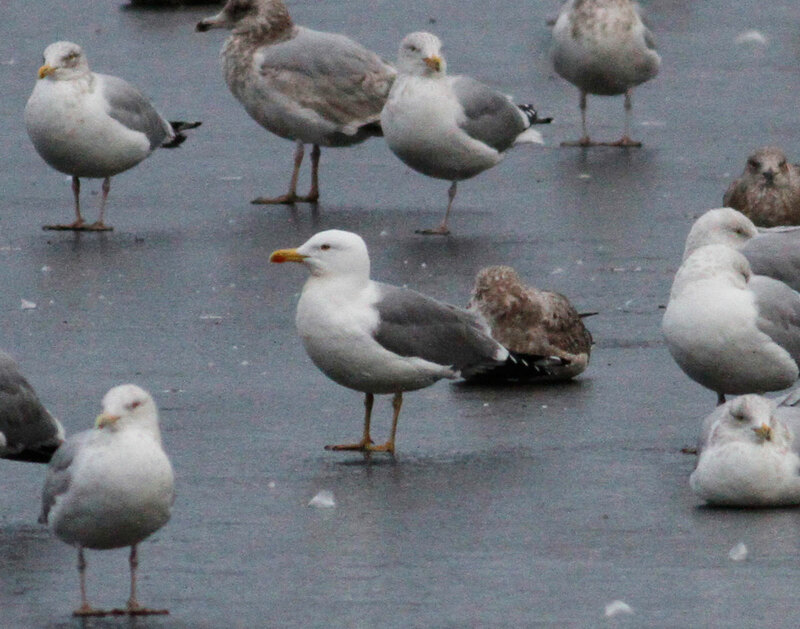 Hopefully, our gull specialists with much greater expertise than I will be able to offer some comments on the identification. 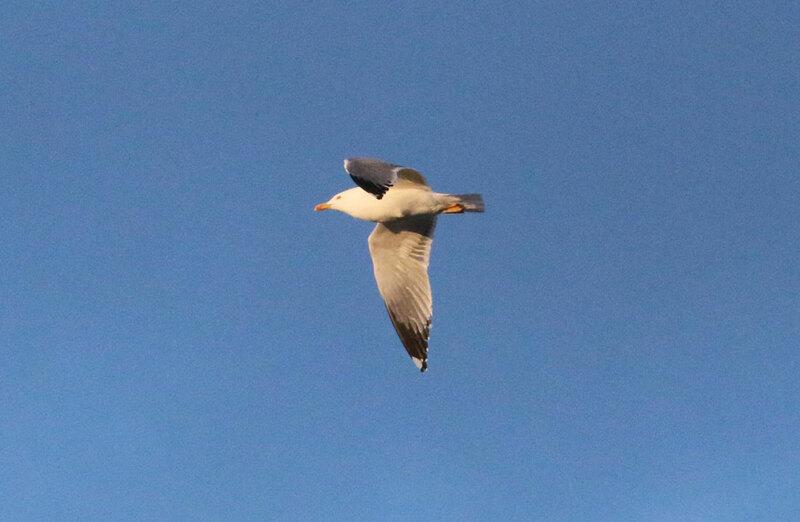 Given the feedback from the North American Gulls Facebook page, it already appears to be a bird of great interest.